After a week, we at BiteYourConsole.net we release a new version of Bite that today comes to version 1.5.1. Bite h&e, this is the name of the new version which is for homebrew, emulation & why we decided to integrate three of the most popular emulators of the scene. The three emulators are the famous PPSSPP of the PSP, which boasts numerous titles, the ePSXe regarding the PSOne and PlayStation 2 emulator, PCSX2. Attention: the emulator ePSXe and PCSX2 BiOS need to operate, the bios for these emulators is owned by sony, unfortunately we cannot provide support on copyrighted material. We wanted to totally change the menus, which as you can see from the pictures they approach remarkably in similarity to the XMB (XrossMediaBar), the graphical user interface developed by Sony. The Homebrew section now is invoked by an external application that is easier in targeted projects. - Improved graphics from Flash, total compatibility on almost all operating systems. - Added three home sony psp emulators, psone and pstwo. 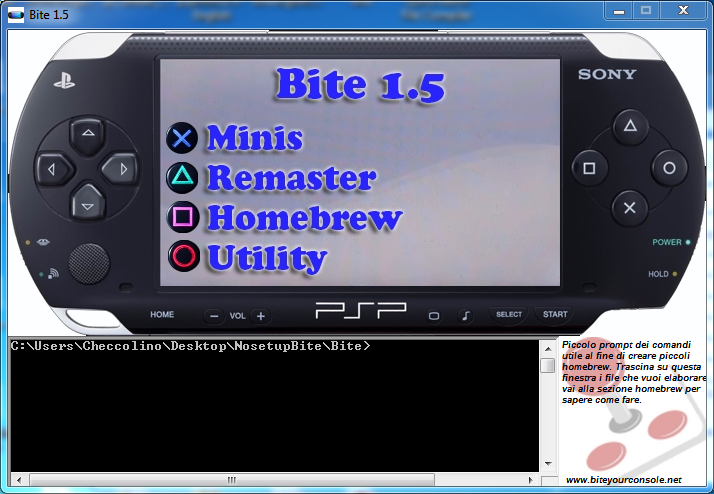 - Added Bite, prompt new external program to develop homebrew for our ps3. - Fixed several minor bugs of the previous version.